Health Screening Packages | Christoph Gelsdorf, M.D. Last month a 32-year-old woman came to my clinic in Yangon after having purchased a “Health Screening Package” at a local private hospital. The package included blood tests for everything from cholesterol, liver function and kidney function to cancer markers and a uric acid. It covered imaging tests including a chest x-ray, mammogram, abdominal ultrasound and a bone DEXA, as well as a urine exam and electrocardiogram. Meanwhile hospitals and health companies are happy to sell a profitable pre-packaged medical product. A broad range of tests are conducted over a few hours and the results are bundled into a booklet with recommendations for further evaluation and treatment. So not only is income generated during the initial health screen, but also through the further tests, consultations and treatments that likely follow. The problem with this approach to screening lies in the concept of the “false positive”. For any given disease, the lower the percentage of people affected in a certain demographic group, the greater the chance that a screening test will incorrectly show someone in that group to have that disease. There is no screening test that is 100 percent accurate, so when we screen people at low risk of a disease we are more likely to see a positive result that is in fact false. In statistics we call this phenomenon ‘specificity’. By way of example, let’s assume that on average 1 in a 1000 cars have a broken ignition that will cause the car to explode. Perhaps the diagnostic test we use to find that exploding ignition is 90pc “specific”. That means that 10pc of the time, the test results in a false positive; The test concludes that the ignition will explode when, in truth, the broken ignition will only do something not dangerous (like not start the car or make a funny noise). If we know that 999 of the cars don’t have exploding ignitions, then this test has wrongly identified the problem in 100 cars, causing their owners to unnecessarily buy a new car. The consequences are of course much higher in human health. Readers of “Living well in Myanmar” will remember last month’s discussion on breast cancer screening and the risks of offering mammograms to women under 50 years old. Providing a mammogram to the average women in her 30s – such as through the screening package purchased by my patient – could be considered medically unethical since any findings identified as cancer are exceedingly likely to be false positives. Unfortunately, my patient’s mammogram identified a mass in her breast. Because of her young age and because she has no other risk factors for breast cancer, this mass is almost certainly benign and any immediate intervention is unnecessary. However, because she had a “positive” mammogram, the hospital automatically referred her to a breast surgeon who gave her the option of surgical removal under general anesthesia. In this way, inappropriate screening in the name of a “medical check-up” sold by the hospital nearly put my patient in the operating room for unnecessary treatment. This wasn’t the only harmful outcome of her screening package. Her blood test showed mildly elevated cholesterol, and as a computer-generated automatic reflex, given to her in the form of a paper print-out, came a recommendation to start a cholesterol-lowering medicine.Initiating a new heart medicine in any patient should never be done based on lab work alone but rather on a comprehensive risk assessment. So her health package also caused harm by introducing a long-term medicine that was unnecessary and has negative side effects. False positives could easily have been generated by the majority of the other tests she received: DEXA is for women at least age 65. 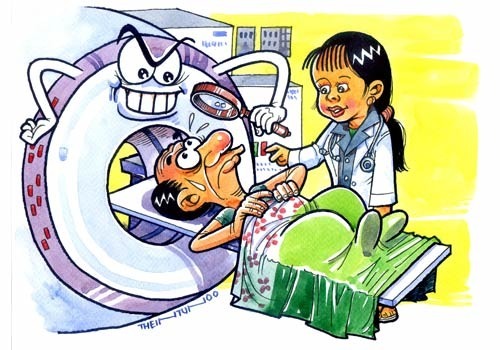 Chest x-rays andabdominal ultrasounds are never needed in a patient without symptoms. Testing for uric acid is meaningless unless a person has gout. Cancer markers are useful only for people with some indication that they might have cancer.An EKG is never required for a patient without heart symptoms. A urine test is useful only if a person has urinary symptoms or is pregnant. These health screening packages are not unique to Myanmar. They are sold at fancy hospitals across Southeast Asia and to a lesser extent at high-end clinical facilities in the United States and U.K where they are branded as “Executive Health Screens” or “Preventative Medical Screenings”. Many people living in Yangon who fly to Bangkok or Singapore to buy a check-up may actually be putting themselves in harm’s way rather than protecting their health. From a public health perspective, generating false positives at best causes excessive anxiety for people that are extremely unlikely to be sick, and at its worst can be physically dangerous. Furthermore, as unnecessary investigations are ordered, it compiles the financial burden of health care for both the individual and the society. Its a fact worth considering in Myanmar’s current debate over how to eventually provide universal health coverage.